The Golden Creek Mill is located in the small upstate town of Easley, just east of Greenville. Today’s Golden Creek Mill, which is one of the prettiest stops along the South Carolina National Heritage Corridor, is actually a replica of the original mill built in the early 1800s. The original mill was built in 1815 by William O’Dell and served as a testament to the ingenuity of that century. The mill produced cornmeal, grits, flour, cotton, and even ice cream – all without the aid of electricity! For over 110 years, the mill was powered solely by the water in Golden Creek. 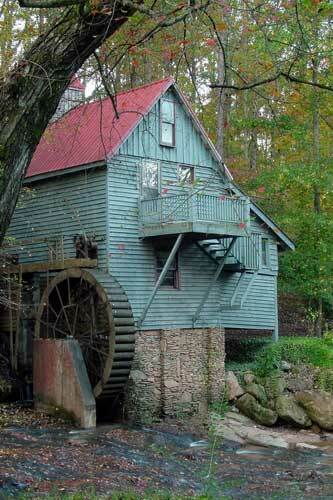 Golden Creek Mill was originally designed as a grist mill, but in 1835 a cotton gin and press were added. Later, in the 1900s, an ice plant was introduced. Several elders in the area still fondly remember the ice cream made with that ice! The twentieth century brought industrialization, and the mill eventually fell into disrepair. 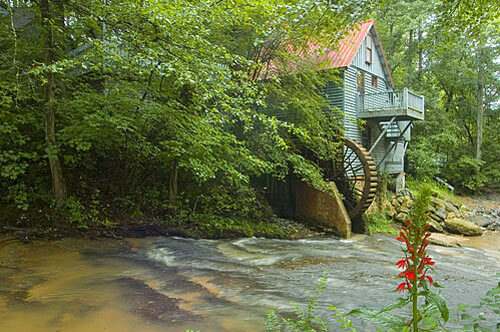 In 1985, Joyce and Leroy Stewart bought the land across the creek and built a replica of the abandoned mill. They brought in antique equipment from all over the country and even imported an old grindstone from Denmark! The Stewarts have stayed true to their model, as today’s Golden Creek Mill is one of the only mills in the country still using hemp ropes instead of gears. However, the mill sits on private property. Many thanks to Jeff Sanders of Greenville for contributing this historical information. You can’t see or photo this mill as it is gated and locked. It is lovely and we would love to photograph it, but can’t. I have a phone number but no one answers (864 859-1958). We don’t need to tour inside, just take a few outside photographs. Is there any way to access? Thank you for the update, we have the text changed! I know the current owner of the mill, and he does no tours at this time. Don’t know if he will anytime soon, or may sell. Thanks. Unfortunately, the website and phone number of Golden Creek Mills are disconnected! I tried to call but it was disconnected and I tried to find the website under SC Mills but it is no longer available. In the mid 1990’s it was my great privilege to do some repair work on the mill. I didn’t build the mill, Leroy Stewart did. I replaced a large portion of the siding and the under carriage. The water had rotted it. I stayed in touch with the Stewarts for several years. The mill has been closed since about ’98 or ’99 or so, Mr. Stewart’s health was failing, he and his wife lived in a house they built on the same property, for a time.They closed the mill because of health issues. As far as I know they still own it. The last time I was by there the mill was in bad need of more repairs. I haven’t been back since about 2001 or so. I don’t even know if the Stewart’s are still living. I want to know if it is still on private property or now is accessible. I checked the comments and they were 2 1/2 years ago. I would love to visit this but I would respect it if it is still on private property. Thank you for the update, Nikki! We hope you found another beautiful spot for your daughter’s photos. This is beautiful. However, it was privately purchased and is no longer accessible. I went there this past weekend with hopes to take my daughters senior pics there, but the gate is locked and there are signs posted everywhere for trespassing.